Benjamin - you may be correct but I certainly would like the ability to add GPS in Lightroom. I have a camera + GPS unit which doesn't work inside buildings (as expected) but the ability to add the data from a shot taken outside the building would be useful i.e. copy from one file to another. I would like to see this ability to be integrated into Lightroom itself. The plugin is great but has to work with "shadow Data". The process of writing GPS data to the exif fields is kind of awkward. Request noted. :-) Just trying to help by telling you what you can do right now, if you so choose. Thank you. It would be even better if I could see all the places where I took photos on a map. Why *are* the geotagging fields hidden unless you import a photo that already has geocoded metadata? If the idea was to preserve geotagging data integrity, this approach seems almost backwards to me! The OP is basically describing Aperture's "Places" feature. He may be as envious of it as I am. While searching my Lightroom collection via old-school location fields is great, it is indeed the "old" way. On the other side of the fence, as great as Jeffrey Friedl's Geoencoding Plugin is (now with reverse geoencoding support! ), it's still a plug-in... one with its own "shadow database." It's wonderful that there are more and more new cameras with built-in geotagging. The same goes for the increasing number of accessories that enable cameras to do geotagging that otherwise couldn't. However, until the technology is pervasive, it would be great if Lightroom gave us the option to add geographic metadata. There already is a similar topic (asking among other the integration with google earth) It would be nice to merge them. Having geocoding into Lightroom (without plugins) would really be great. And do not forget to add bearing data. More and more camera include this ( I know at least 4 different compact doing this and all Nikon DSLR and Pentax DSLR have attachable GPS unit that can provide this metadata).It is really great then to look at the photo in Google earth with the correct orientation. Geosetter is one of the few programs that allow you to set this info and/or view it as well. 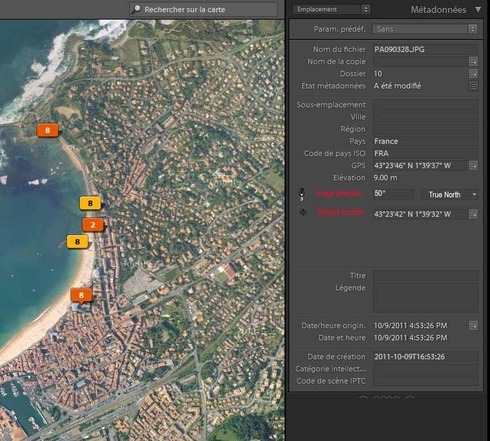 I would love to be able to import a GPX or similar file right into Lightroom and have the GPS metadata added to the files. Or allow a better integration with Jeffrey Friedl's plugin, so that shadow metadata isn't necessary anymore (i.e. this will get rid of the extra step consisting in reading metadata from file). I would like a function to geotag my photos like it is possible using GeoSetter http://www.geosetter.de (using maps or synchronising with GPS-Tracks). As an addon the possibility to use this feature offline (e.g. with pre-downloaded maps) would be fine for shootings without net-connectivity. -the altitude or elevation of the photo. Espescially when photos are taken from above the ground (aircraft, paraglider, high building,...) Currently if the info is available it will be shown, but you won't be able to edit it or add it. when I zoom to much and the photo are not clustered any more they disappear from the map. if the image position is wrong (example bad gps fix) move the marker rather than drag and drop the image again(it is alittle more natural when the image already has a marker),. This is a bug. You should be able to see the individual pins on the map when zooming in. And, though you cannot drag clusters of pins all at the same time, you should be able to drag a pin (representing a single photo) to a new location on the map. Great that then exactly working as I though it should except , that I do not get this behaviour. I wil try to upload you the photos I am using, let me know how. when you release the mouse button the coordinate of where the mouse is , is used to both sets the subject location and image direction of the selected photos. I made photo in a cave. Unless you really well know the cave it is impossible to say where you took the photo. I used the photo direction to find in which cavity the photo was taken (when the photo was roughly parallel to the cavity direction) and the used the altutide of the photo (from manometer reading - though the camera manometer is not very precise) to adjust the photo position in the cavity (as I had a depth map of the cavity). adding these data are not too much overkill but I am sure will be used by many. and a lot more fun to view. This reply was created from a merged topic originally titled Lightroom 6 geo tag tracking. I'd like Lightroom 6 to manage GPS data like Aperture. with my Canon 6d i need to import separately GPS tracking data, convert it with another 3rd part software and the watch my route in a 2nd moment. unbelievable on Aperture it was straight-full and easy as import pictures...the software automatically import GPS position and tracking so i know exactly my position on the map.. the route i did... and even my sight direction when i've shot a given photo!